A plumber installs and repairs pipes that supply water and gas to, as well as carry waste away from, homes and businesses. He or she also installs plumbing fixtures such as bathtubs, sinks, and toilets, and appliances, including dishwashers and washing machines. Most plumbers have full-time jobs. About one-tenth of all plumbers are self-employed. The job outlook for this field is excellent, according to the U.S. Bureau of Labor Statistics. Employment is expected to grow faster than the average for all occupations between 2016 and 2026. *The Bureau of Labor Statistics reports wage and employment data for plumbers, pipefitters, and steamfitters together. 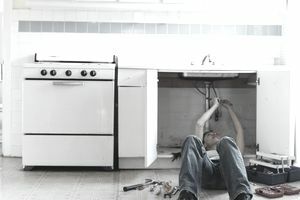 How do employers describe plumbers' job duties? To find out, we turned to employment site, Indeed.com to see what employers had to say. Here are some common duties. "Installs, maintains, and repairs chilled water, hot water and steam systems, traps, valves, piping, backflow preventers, general fixtures of all types." "Unstops sewers, lavatories, sinks, and commodes." "Maintains required operating forms and records and assures proper use of all assigned shop equipment." "In cases of malfunction or breakdown, he or she will visually inspect the fixtures or equipment and use appropriate test equipment such as pressure and vacuum gauges to determine cause and location of trouble." "Maintains all plumbing, fittings, fixtures, and pipelines." "Develops and presents a complete set of recommendations and related pricing that addresses the initial call, corrects any deficiencies of the systems (undersize, code conflicts, part likely to fail, etc.) and also improvements to the client's comfort and lifestyle." You will probably have to work evenings and weekends. You will have to work overtime, which could mean being on the job more than eight hours a day and more than 40 hours a week. In order to respond to emergencies, you may have to be on call regularly. Plumbers frequently sustain injuries, including burns, cuts, and falls. Most plumbers receive their training by doing an apprenticeship, which combines classroom instruction with paid on-the-job training. Apprenticeships are sponsored by trade unions and employers and last from four to five years. You will need a high school or equivalency diploma and must be at least 18 years old to be accepted into a program. In the classroom, you will learn about local codes and regulations, blueprint reading, and safety. Plumbers are required to have a license to work in most states and municipalities in the U.S. In addition to needing two to five years of experience, depending on where the license is issued, you must also pass an exam. What Soft Skills Will You Need? What job requirements, in addition to skills, experience, and a license, are employers seeking? Again, we looked at job announcements on Indeed.com to see what different employers were posting as expectations. "Able to read and interpret work orders, parts requests, drawings/schematics/blueprints, and manuals in order to accomplish assigned duties." "Able to follow policies and procedures." "Must be able to work under time and budgetary constraints and pressures." "Show yourself as professional and knowledgeable to win new referrals and repeat business." "Outgoing, professional, clean cut, aggressive, and drug-free." "Friendly with a great deal of patience." Sources: Bureau of Labor Statistics, U.S. Department of Labor, Occupational Outlook Handbook; Employment and Training Administration, U.S. Department of Labor, O*NET Online (visited May 10, 2018).